Is the sanitary towel disposal system so complex that women are unable to understand what’s expected of them? I don’t think so. Are women using the sanitary towel disposal system as it should be used? No. There’s a significant deviation from the behaviours designed into the system. I know what that is because I’ve seen the angry post-it notes on the inside of the toilet cubicles, describing of the non conformities in graphic ways, with angry words. Then a less emotive sign appeared on the inside of the cubical doors. The sign instructs users how to use the sanitary disposal system, but given knowledge of the system is not the problem this sign will have minimum, if any, impact. A woman has to remove the sanitary towel from her pants before she can pull up her pants. To pull up her pants she has to put the sanitary towel down (in the flowery paper bag) because pant pulling up requires two hands. The two most obvious places are on the floor or the toilet roll dispenser. After pulling up my pants I flush the toilet, this is a strong habit ingrained over half a century of using western style toilet. I suspect this is the break point, because the floor and the toilet roll holder are not in line of sight as a reminder of the package. It’s easy to turn and leave the room without remembering to pick up the frou frou package. picking up a package to carry into the bin under the hand dryer is not part of a normal toilet behaviour. People don’t do it anywhere else, so it’s not habit and there’s no in-situ reminder. 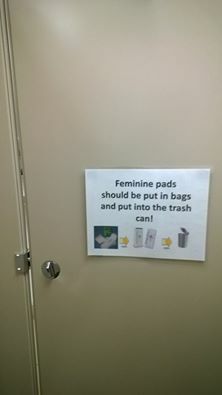 Now there’s a sign on the door, this will work temporarily, but then they will get used to the sign and cease to notice it… I think it’s time for me to talk to the facilities manager and request bins in the cubicles. A more usable system. This scribble was published on Sunday, June 28th, 2015. You can follow any banter on this scribble with the RSS 2.0 feed. You can share your inspired musings after typing the anti spam word near the bottom of the page. But no Pinging because its too naughty.